My second solo exhibition will take place at Gallery Palette in Tokyo from May 17 to 22, 2016. This is very exciting as it's also the occasion to launch the book and hold several workshops again. I will be at the gallery every single day from 11am to 6-6:30pm and I would be delighted to meet you and introduce you to the book - and maybe sign your copy too! Here below is the workshop schedule if you are interested in joining us. Make sure to specify clearly the project you are signing up for as well as the date and time. We also need a phone number to be able to contact you. Also don't forget to save the date and mark it done in your agenda! 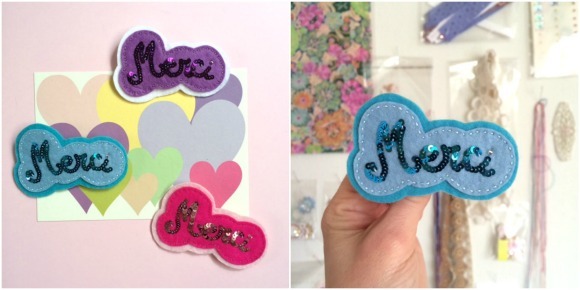 Make a cute bi-color felt brooch with the French word “Merci” which means “Thank you”. Participants are free to choose their favorite color combination among the available materials. - spankles are sewn in line following the word template. 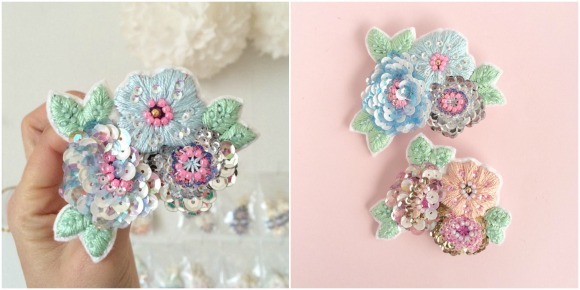 Spend a wonderful time with like-minded people and make a stunning, unique flower bouquet brooch using various materials & techniques. 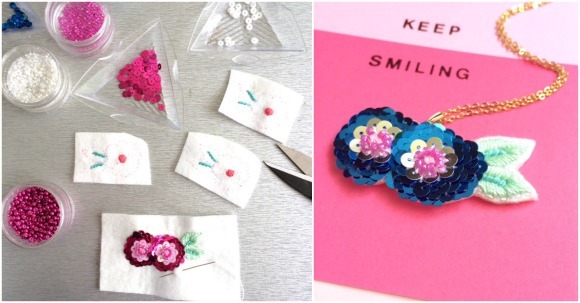 Bringing you the popular and beloved pansy flower pendant, a best-seller! Create your own delicate pendant and choose your favorite color combination among the materials made available. Perfect piece for the Spring and Summer seasons! A beautiful statement piece to adorn your summer outfits, and your jackets too! 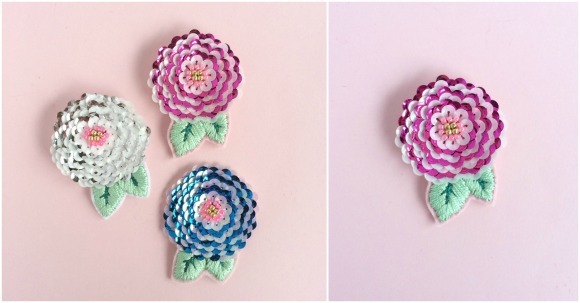 This flower brooch, unlike other designs, is created with only two spankles colors, to create this unique pattern. - spankles sewn using the fish-scale technique, in a bi-color style. 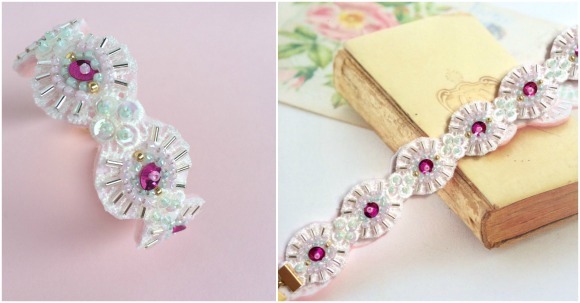 Create a unique and elegant bracelet using various types of sequins and beads, on a lace base by Japanese label Mokuba. 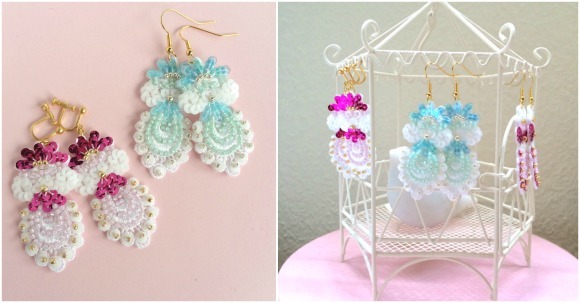 Project:This is the latest earring design that is also featured in the book. There are created on a lace base with a very elegant style. Download the workshop schedule in English (HERE). 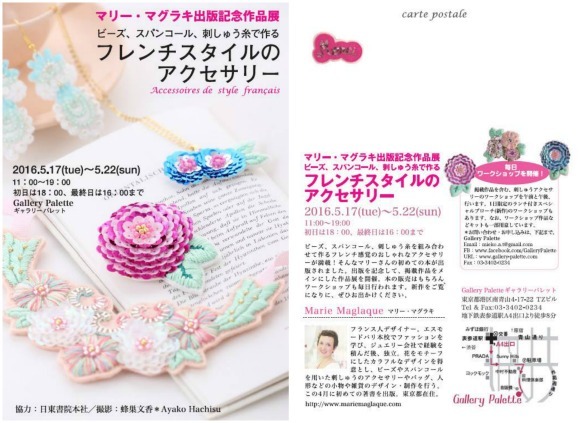 Download the workshop schedule in Japanese (HERE). Feel free to contact me anytime if you have questions, and let's meet up at Gallery Palette next week!